We seem to be in a Snow White phase. There are two movies out that focus on the raven haired maiden and her adventures. This version takes a more realistic approach to its filming and keeps a balance of fantasy and faith as its main message. One of the biggest concerns with this film was the performance of its star, Kristin Stewart. Her work in the Twilight series has been brought into question by lots of different people who either hate or love that franchise. It was great to see her in something that had a little more strength as a character. I give this movie a green light for its stunning cinematography and its great execution of mixing personal faith within a fantasy world. Thanks to the Brothers Grimm, we are familiar with the German fairy tale about a faire maiden named Snow White (Kristin Stewart) who is far more beautiful than her evil step mother the queen (Charlize Theron). 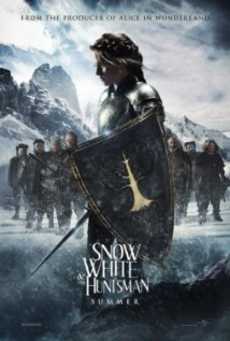 The queen sends a Huntsman (Chris Hemsworth) into the dark forest to kill snow white. Snow is befriended by eight Dwarves who are named Muir (Bob Hoskins), Beith (Ian McShane), Gorth (Ray Winstone), Coll (Toby Jones), Duir (Eddie Marsan), Quert (Johnny Harris), Nion (Nick Frost), and Gus (Brian Gleeson). This is where the movie takes a different turn. They join forces with group of locals who oppose the queen and use Snow White as a rallying point to start a revolution and usurp the queen. This movie does a wonderful job of mixing the imagery of evil as dark and gruesome and horrific, contrasted with imagery of good as beauty and wholesomeness and purity. The director (Rupert Sanders) is really new in the role as director and he shows huge potential as a storyteller with this debut film. What I like best is Sanders’ ability to blend in so many subtle details into the story. For instance, there were small things about the queen’s wardrobe and style that had something dead mixed into every scene she was in. His eye for the cinematic background is also exceptional. He has these very stark, dreary and muted villages that are under the queen’s control and pockets of resistance to the queen’s power are painted with bright vibrant color and full of life. On the strong female character front, this movie does a much better job of showing a strong role model for young women. Snow gives a stirring speech, saying follow me because I am the only one who can kill the queen. She reminds me of Joan of Arc, at the front of the fight, in armor, army at her back. Out of all the Snow White movies this year, this one is definately my favorite.